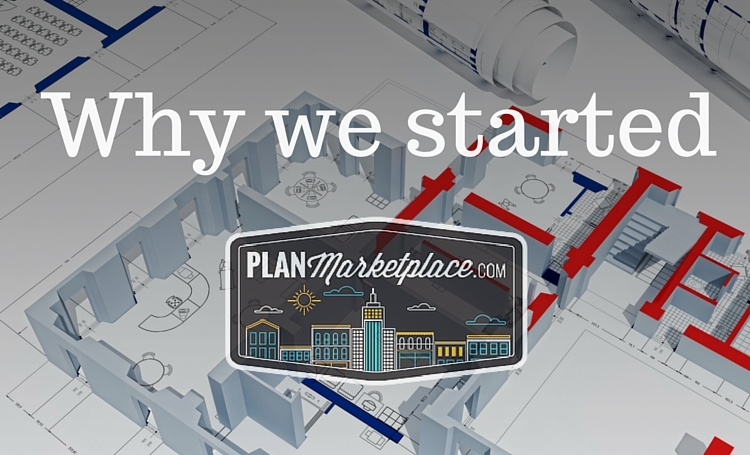 After a lot of work, Planmarketplace.com is online and going better than we imagined. We knew we were onto something when we began developing this idea. The idea of a true marketplace for designers, architects, and engineers to share tools and lessons is a game changer for our profession. It will solve some of the challenges we faced in our own firm. The idea came about during one of our normal company reviews, we wanted to look deeper at some of our challenges and opportunities to be more successful. We asked ourselves what is holding us back, what are we doing that needs refining or rethinking and what are we not doing that we should. We also started looking at what other professions and industries were doing that the design community wasn’t and asked why weren’t we. This process highlighted 2 major issues. Recreating work and byproduct waste. The first item, recreating work, was frustrating because we had either previously done this work on another project or we knew someone had already done it. For example, when our designer was putting together a set of drawings, she would need to create a detail that is fairly standard in our office. Even if we had done the detail before in our firm, no one knew where the detail was in our files. Keeping an up to date digital library always sounded like a great idea, but never got any traction, because we were always busy on projects. Or we knew of a project by another designer that had exactly what we were looking for. But it is not customary to call another designer to ask for their working files. Even if you would gladly pay something to save you the time of recreating the detail, it seemed like an odd request. So why was there not a place to find drawings and details that we needed. Why was there not a place that enabled you to search and navigate through details. There were plenty of sites with manufacturer details, but that is never what you get stuck on during the design or production process. We have all been on google images hoping we stumble upon the solution to our exact situation. We needed an organized CAD/Revit library that had a lot of details, they had to be searchable and it had to make financial sense. I didn’t want to sign up for a recurring monthly fee if I only needed one detail. And I didn’t want to pay hundreds or thousands of dollars for tens of thousands of details and blocks that were majority junk that I would never use. The second item we kept hearing about was other organizations and companies getting value out of their byproducts. Byproduct is defined as a secondary product that is the result of the primary production process. It is usually common to think of it in a chemical process. Think of asphalt being a byproduct of gasoline production. But it was also being used by other companies in new ways. Entrepreneurs were taking the lessons they learned and turning those into best-selling books. The book and information in the book were byproducts of the process they were already going through. So we took a look at our byproducts. These were the drawings we produced for each project. We primarily produced these plans, sections, elevations, details, etc. for a specific project. Once the project was complete, we saved the files in our job folders, only taking up storage space on our server. But was there any value in these drawings? Not all of them, but surely some could be of use for another designer who is doing a similar building or detail. And since they are byproducts from our original process, I have no investment in its development or repackaging, meaning I don’t need to charge a large fee to sell these drawings, as I have already been paid for the initial production. Give our solution, PlanMarketplace, a try! These two items started to flow together. The ideal situation would be for a designer to complete a project, post the project working files or details online, have another designer purchase the project files or details, which saves them research and drafting time. That is the classic win-win scenario. The buyer saves time and, therefore, money on their new project and the contributor makes additional money with little to no additional work. The contributor can make this same sale over and over and over. So that one project not only produced a profit initially, but it keeps making money long after the project is over. And with no investment it just adds to the bottom line for pure profit. Another one of those rare “makes money while you sleep” ideas was born. So we went full steam ahead on the development of this website to solve these issues for our firm as well as the design community as a whole. We still have a lot of work to do but continue to work every day to add content, improve the user experience and market the available files for the contributors. Join our effort and let’s work together to improve our profession and our bottom line!